A group of office workers from the Southern Pacific Railroad headquarters in San Francisco on a weekend trip to the snow; taken in Truckee, California, February, 1921. 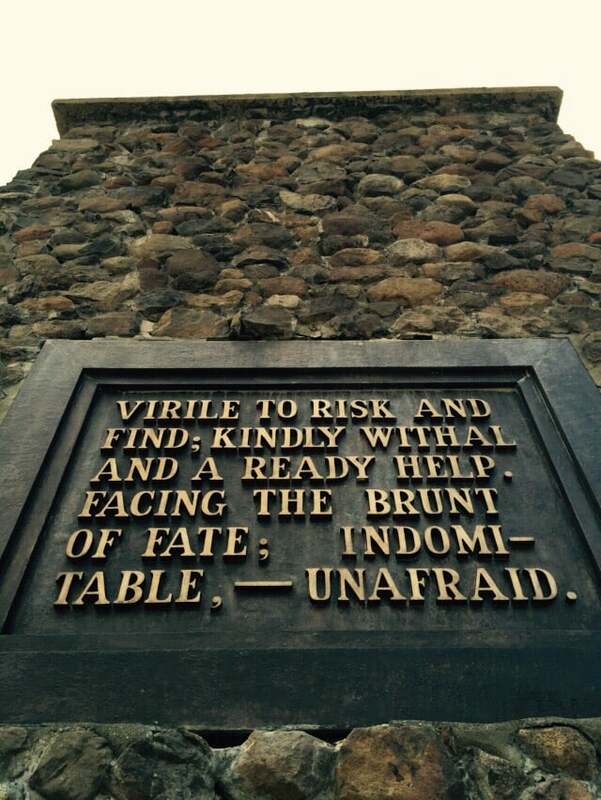 That’s the base of the Donner Party monument behind them. Dot Barton (my Aunt Dorothy,) with Jen, Spurr, and Dot Robinson at Truckee, 1921. Dot B. is wearing a very hairy sweater, and she’s borrowed a huge Tam-o-Shanter from her friend Dottie Biggs. Dottie Biggs and Dorothy Barton in Truckee, 1921. 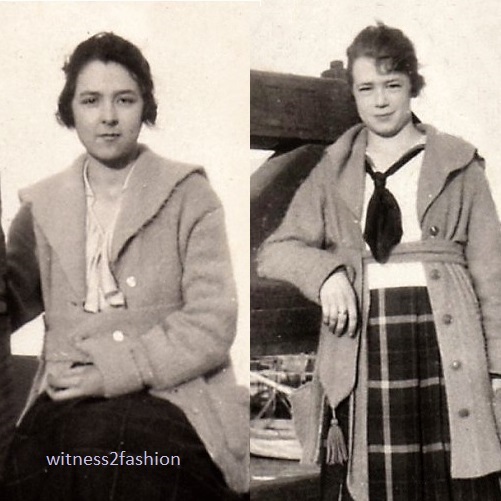 It was only by enlarging this section of the photo that I saw the shawl and huge tam on the woman standing behind them. The woman in the middle is Dottie Biggs, wearing a long, thick sweater. 1921. Dot Barton and Lloyd Muller in 1921. She is wearing the full-legged knickers that many women wore for sports. Her sweater is not too different from those of 1917. He’s wearing his cloth cap turned backwards…. like a baseball cap in the nineties. Gladys Spurr and Dot Robinson in 1922. My Aunt Dorothy, nicknamed Dot, worked in an office with Dot Robertson, Dot Robinson, and Dottie Biggs. It must have been a relief when Adeline and Gladys were hired! For those who live where snow is a normal event, I should explain that it only snows in San Francisco a couple of times per century. Some people “go to the snow” on the mountainous eastern side of the state every winter — just to see snow. It seems odd today to think a sweater would be enough protection when the snow is falling, but that’s what all these women are wearing, along with knickers or riding pants. Gladys Spurr and Dot Robinson face the cold in sweaters and wool twill riding pants. 1921. Dot Barton’s long sweater has pockets big enough to hold her gloves. She has probably laced gaiters over her legs, with turned-down socks. Dottie Biggs in a sweater vest over a dark shirt, plus a long, thick sweater. And that wonderful hat…. 1921. I can’t get enough of that Tam-O-Shanter — and her attitude. A giant Tam-o-Shanter — very chic in the late teens and early twenties. Notice that she’s wearing earrings and … is that lipstick? It’s lovely to see the fun they had — almost a hundred years ago. Why did they want to sit on the roof? Probably because it was there. Donner Lake, 1921. Because these young people worked for the SP railroad, they probably took advantage of cheap tickets for weekends at Russian River (in the summer) and at Truckee or Lake Tahoe in the winter. The train from San Francisco through the Sierra Nevada mountains still goes through Truckee on its way to Reno, Nevada and points east. The “gang” from the SP office may be thinking of some liquid refreshment…. Especially that guy wearing just a shirt and bow tie over his sweater. Sadly for them, Prohibition went into effect in January of 1920. But the sign on the rock was still there in 1921. While sorting my Aunt Dorothy’s huge collection of photos, I found these charming pictures of an informal wedding in the nineteen twenties. 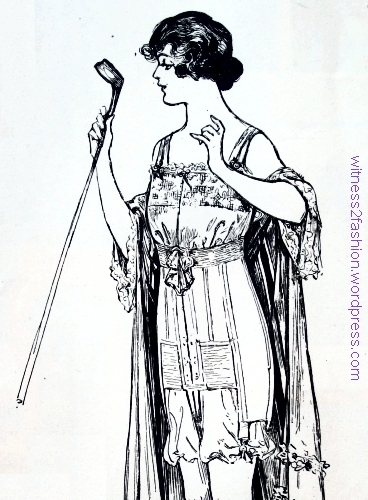 The skirt lengths suggest 1927-28 to me. 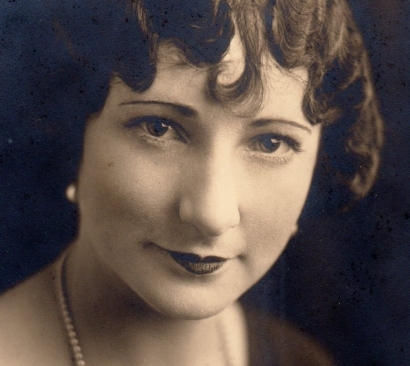 Happy faces (for the most part) and real-people hairstyles and clothing from the late 1920s. Left side of group photo. The men’s hair looks natural, not slick or oily. More wedding guests, this time from the right side of the photo. Although my aunt knew a great many women called “Dot,” — and she herself was called Dot — I haven’t been able to match “Dot the Bride” to any other photos, so I can’t find her last name, or date her wedding exactly. 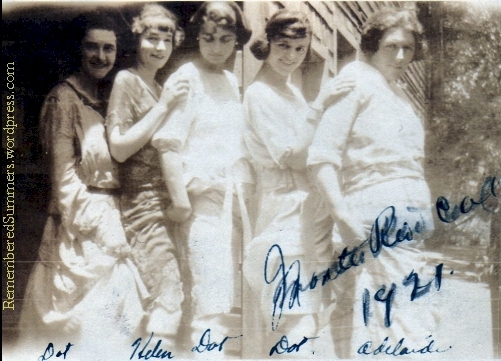 Dot Richardson and Dot Robinson, on an office outing to Monte Rio, California, circa 1921. Dot was the usual nickname for women called Dorothy. There’s a good chance that like my aunt, the bride or her groom and most of the wedding guests worked at the Southern Pacific Railroad Headquarters in San Francisco. They all seem to be in their twenties or thirties. Dot and her husband. I love his pocket square. Like the bride, many of the female guests are wearing their Marcelle-waved hair loose, longish, and full. Dot wears dark lipstick, too. The bride and groom have a sense of humor, judging by the toy bulldog on a leash in the foreground. Here the newlyweds pose with the honeymoon car, decorated with a “Just Married” sign and several big, tin cans to make noise as they drive away. Their friends have tied several cans tied to the bumper to ensure that everyone notices the “Just Married” sign on newlyweds car as it clatters down the road. Her huge corsage must mean “Maid of Honor.” She wears a light coat over a knee-baring print silk dress; big bows trim her shoes. As sometimes happens with informal weddings, not everyone got the “not too casual” message. (Yes, I mean you, Mister Sweater and No Necktie.) His boutonniere says he’s part of the wedding party. I wish we could see more of this dress on a Bette Midler look-alike…. Whether she’s gaining a son or a daughter, this mother looks happy. The mother of the bride (or groom) looks very up-to-date in her short dress, worn with dark stockings and low shoes. The bride’s dress appears to be waistless, possibly a princess style with a bow and drape at her left side. The white-haired lady’s dress has a V-shaped lace insert in the bodice, and a two-tiered skirt that just covers her knees. She hasn’t bobbed her hair, however. I hope this bunch of pleasant-looking young people had very happy lives, and many equally pleasant celebrations. It’s easy to imagine enjoying their company. 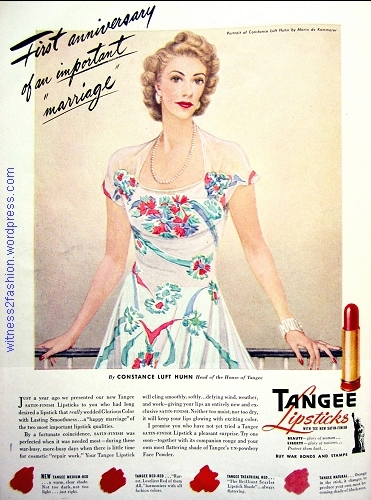 Full page Tangee lipstick ad, Vogue, August 1943. 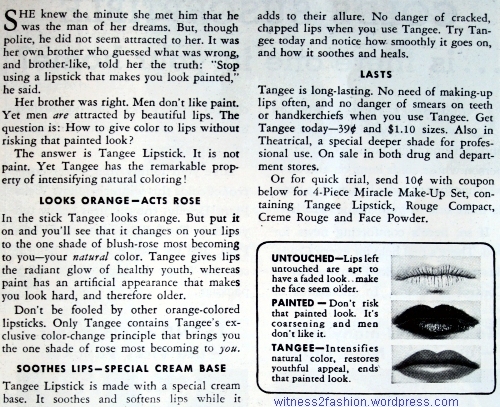 Tangee for the lips: This advertisement for Tangee color-changing lipstick is from Vogue’s college issue – August 15, 1943. You can see the patriotic “Buy Bonds” text at right. Tangee Natural lipstick, right, and Tangee Theatrical Red, left. Vogue, Aug. 1943. “Orange in the stick, it changes to produce your own most becoming shade of blush-rose.” Body heat transformed the translucent orange Tangee Natural lipstick to a light salmon pink when I tested it on the back of my hand. 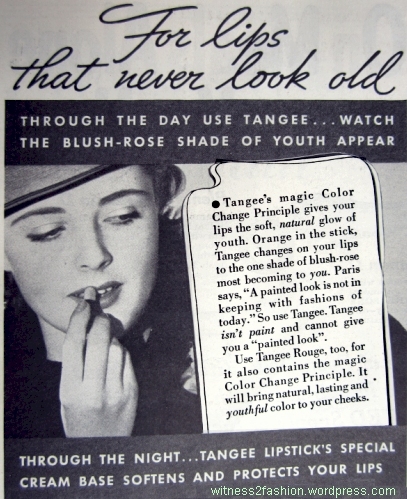 In this ad, the tube of Tangee lipstick looks completely colorless. 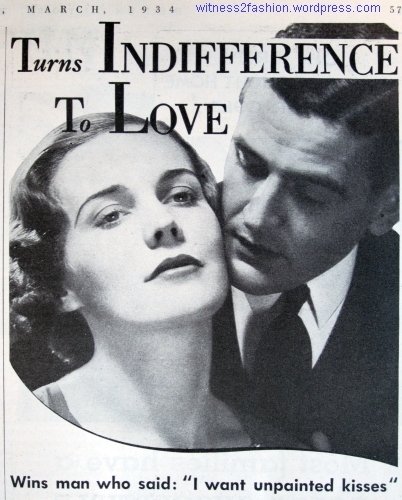 Woman’s Home Companion, Feb. 1937. 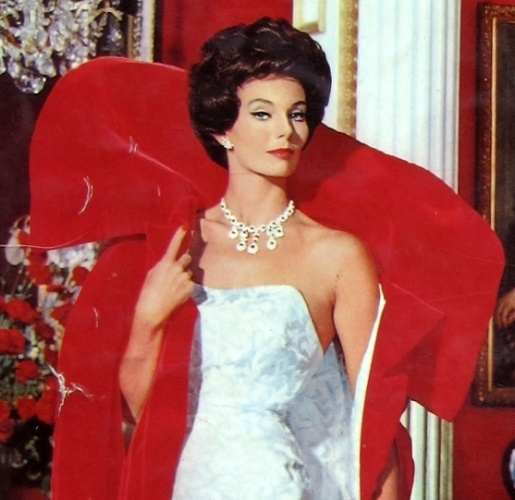 Ad Detail for “Fire and Ice”, a vivid red lipstick from Revlon, Elegance magazine, 1962-63. This series of Revlon ads targeted grown women, not teens. 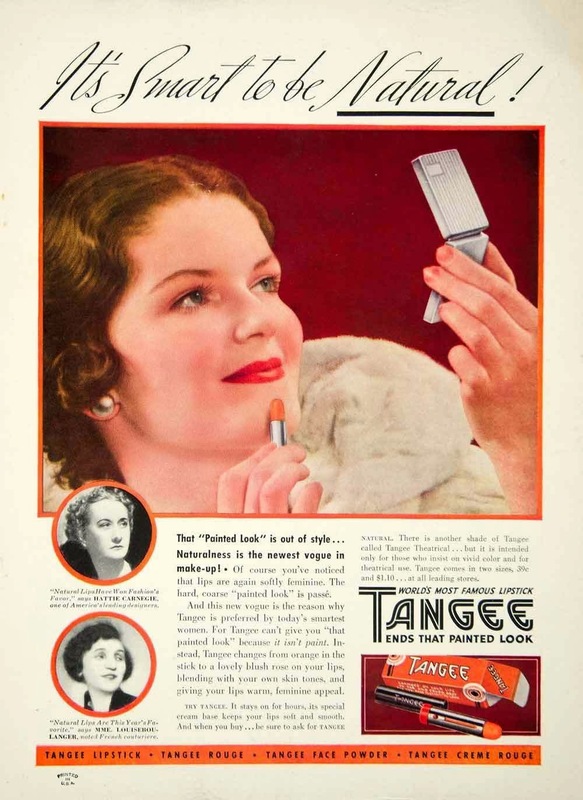 Tangee color-changing lipstick ad, Delineator, Nov. 1934. We didn’t have a Woolworth’s Five and Dime store, so we bought our Tangee at the local Ben Franklin Variety Store. 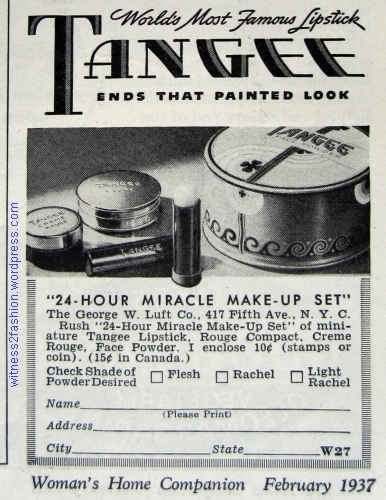 It wasn’t an expensive brand; perhaps Tangee still came in both small and large sizes. 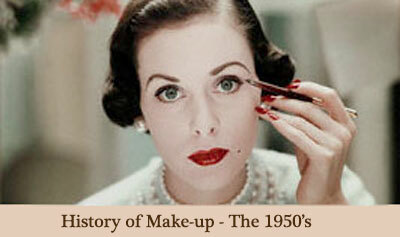 In 1958, young teenagers (Junior High age) didn’t usually wear any other makeup. 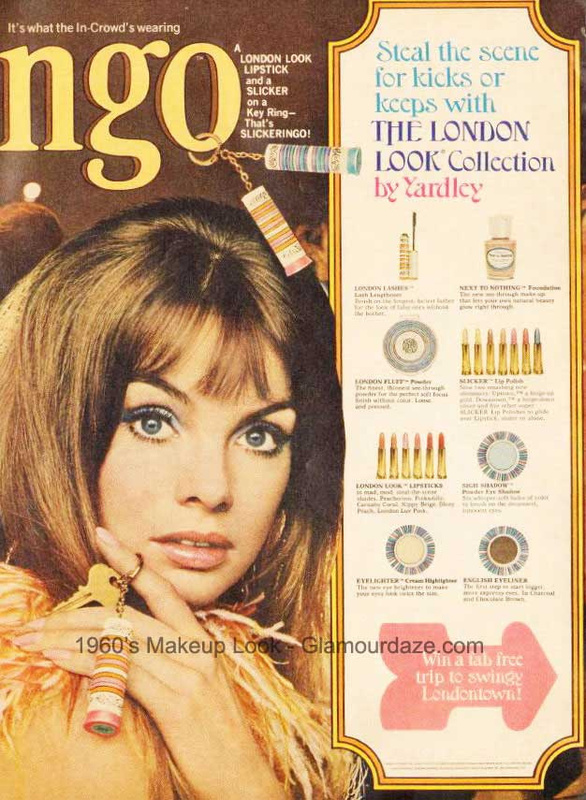 We did eventually move on to mascara in high school; Maybelline, then as now, was available in drugstores and affordable even on a very small allowance. 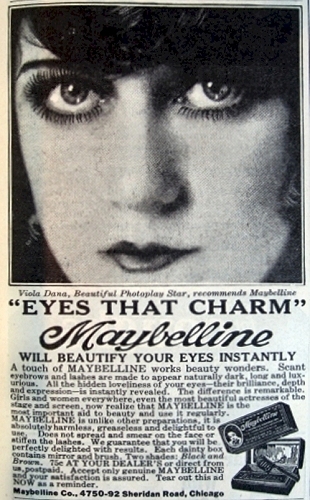 Top of Maybelline Mascara ad, Delineator, Feb. 1924. However, I have no memory of Maybelline in a liquid form. Detail from Maybelline ad, 1929. Waterproof liquid Mascara at right. Detail, Ad for Maybellline Mascara. Vogue, August 1943. 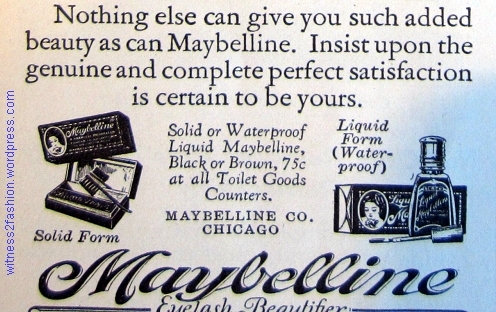 The Maybelline product and packaging were familiar to me from my early childhood, because my mother had used it for her entire adult life. This ad is from a 1943 magazine. 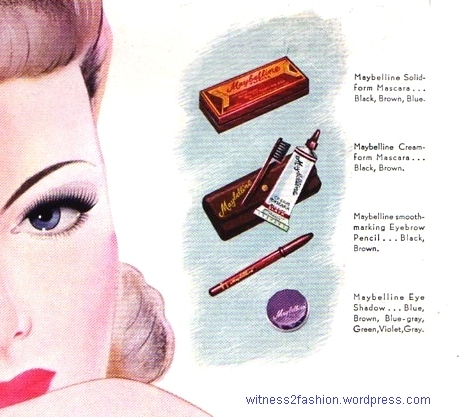 . .
Maybelline Mascara ad, Vogue, Aug. 1943. 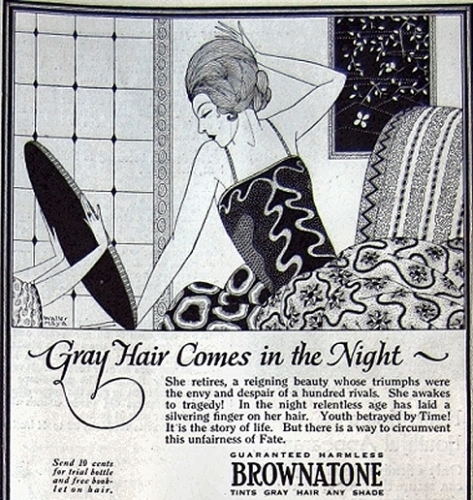 Maybelline Mascara Ad, Delineator, May 1924. 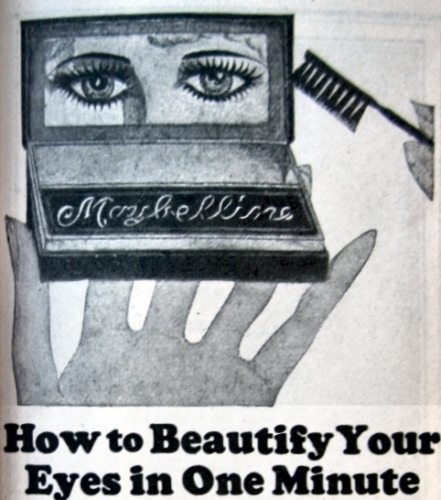 Maybelline Mascara was an old friend to my mother, a would-be “glamor girl” in the 1920’s. My mother. Office worker in makeup, circa 1929. In addition to applying mascara to her lashes, she has powdered over her natural lip line and created a dark red “cupid’s bow” or “beestung” lips. She’s obviously not a fan of subtle Tangee lipstick! 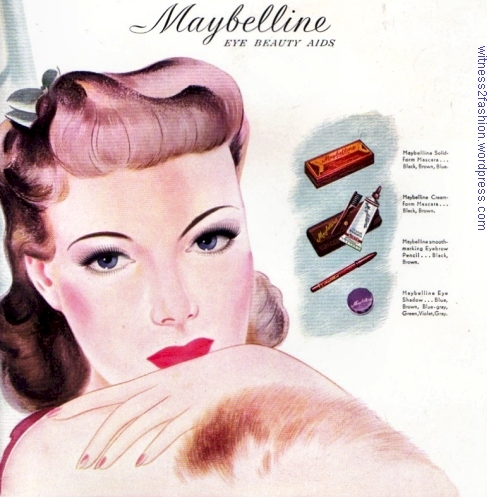 Maybelline also made eyebrow pencils, of course, but young teenagers I knew in the 1950’s did not use them to line their eyelids, at least not until we were in high school, and usually not while attending classes before 1960 or so. We tried to be subtle. The nuns had sharp eyes. So did our parents. 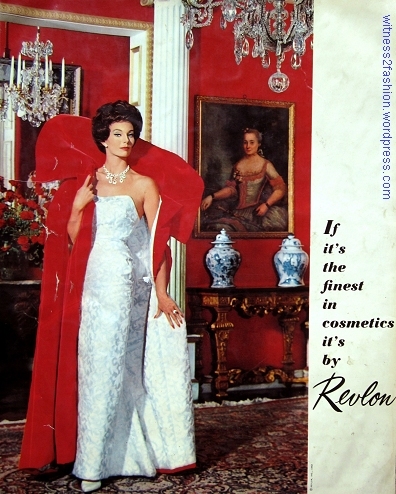 Ad for Revlon lipstick, Elegance magazine, 1962-63 issue. 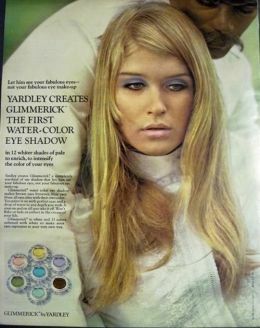 White Lipstick and Black Eyeliner: The Sixties. 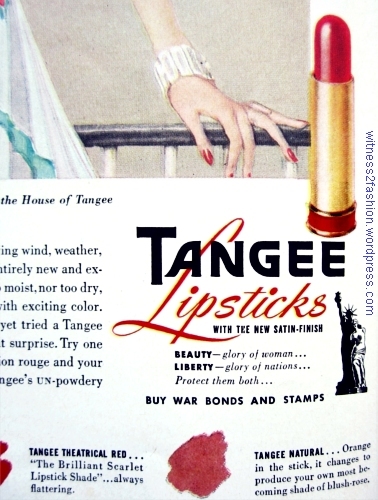 Once our parents got used to the sight of us in our Tangee lipstick, it was time to move on to a relatively light colored Revlon lipstick called “Persian Melon.” (It was more coral than red.) 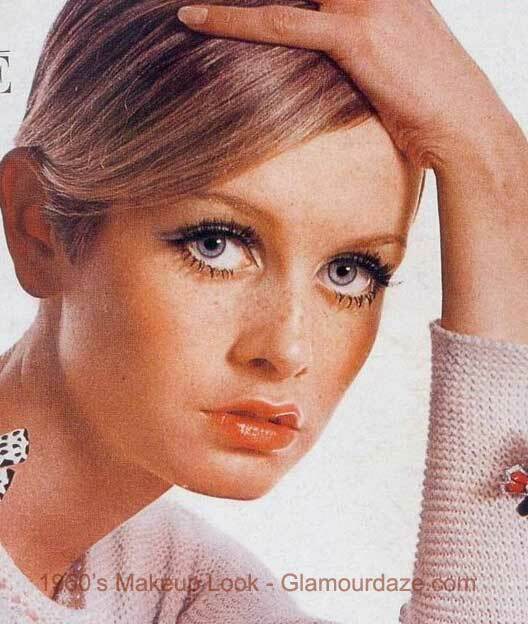 Then came the mid-1960’s – the Beatles, Mary Quant in Vidal Sassoon Haircuts, the Mod Look, supermodels Jean Shrimpton and Twiggy, the glorification of all things British – and Yardley (of London!) cosmetics, which targeted the new youth market with white lipstick, tons of eye makeup, and eyeshadows in a rainbow of colors. But I still bought Maybelline mascara in a little red box. 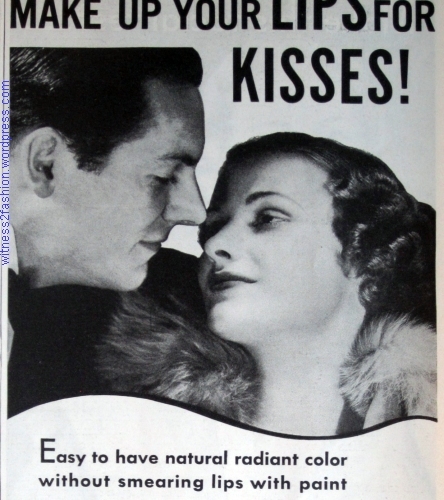 “Wins man who said: ‘I want unpainted kisses.’ ” Tangee ad, Delineator, March 1934. 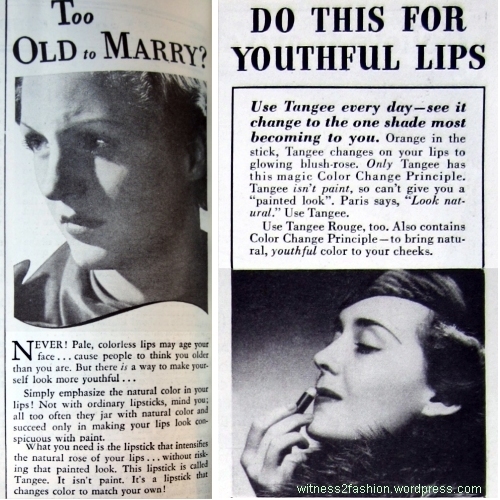 Tangee lipstick ads from 1934, left, and 1937, right. 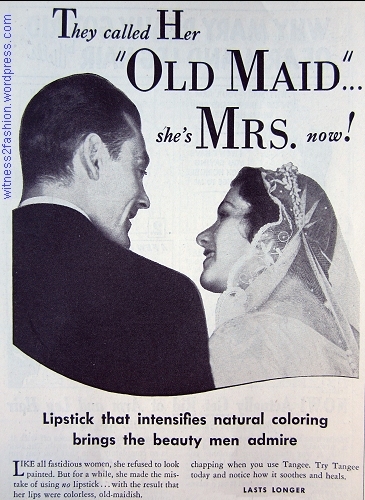 “Simply emphasize the natural color in your lips!” Notice that the lipstick appears colorless in this ad, although the model’s lips look fashionably dark. Eventually Tangee branched out into more vividly colored products. Tangee Natural lipstick is still available – with delightful testimonials – from Vermont Country Store. 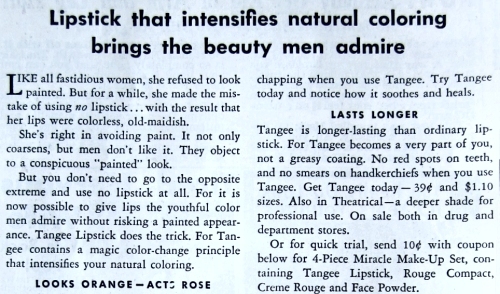 If you wonder how lipstick was made, Glamourdaze reprinted a story,”Inside the Tangee Lipstick Factory,” from 1947, when 190 million individual tubes of lipstick — from all brands — were sold!